Now you haven't extra mobile storage, your storage is filled by some unusual whatsapp data like images, text, and video etc. You want to delete those file one by one ,but you can't delete one by one because it's too boring work for all people. But you need to delete those file for reduce your storage. No need to worry, we have a solution, now we can delete all unusual and old data by one click. First of all, you have to need to install whatsapp official beta version. How to install whatsapp beta version from Google play? Ok, this is pretty easy . You just go to Google play store and search whatsapp. Then open whatsapp and scroll down and you can see a apply notice for beta tester. Then click on "I'm in" for apply. And you need to wait some hours. Then again go to play store and you can see you just approved by whatsapp for beta version. Then you can download whatsapp beta. 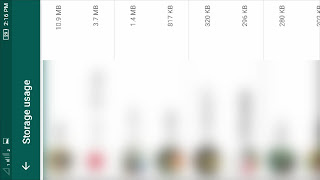 How to delete multiple unusual whatsapp data? And then click on "data and storage use"
Then again click on "storage" . This is the new feature. Then click on a number for what you want to delete data from that​ number. Then in that number you can see your storage size like images, video, text message, voice clip etc. Next you need select what you want to delete from whatsapp. And then click delete button down below. Finally you can delete your whatsapp unusual data. And free storage. That's for all in this article guys. And I'll see you in the next one.